Word Origin: German zinke: of obscure origin, probably German for tine. Zinc metal crystals are sharp and pointed. It could also be attributed to the German word 'zin' meaning tin. Isotopes: There are 30 known isotopes of zinc ranging from Zn-54 to Zn-83 . Zinc has five stable isotopes: Zn-64 (48.63%), Zn-66 (27.90%), Zn-67 (4.10%), Zn-68 (18.75%) and Zn-70 (0.6%). Zinc has a melting point of 419.58°C, a boiling point of 907°C, a specific gravity of 7.133 (25°C), with a valence of 2. Zinc is a lustrous blue-white metal. It is brittle at low temperatures but becomes malleable at 100-150°C. It is a fair electrical conductor. Zinc burns in air at high red heat, evolving white clouds of zinc oxide. Uses: Zinc is used to form numerous alloys, including brass, bronze, nickel silver, soft solder, Geman silver, spring brass, and aluminum solder. Zinc is used to make die castings for use in the electrical, automotive, and hardware industries. The alloy Prestal, consisting of 78% zinc and 22% aluminum, is nearly as strong as steel yet exhibits superplasticity. Zinc is used to galvanize other metals to prevent corrosion. Zinc oxide is used in paints, rubbers, cosmetics, plastics, inks, soap, batteries, pharmaceuticals, and many other products. Other zinc compounds are also widely used, such as zinc sulfide (luminous dials and fluorescent lights) and ZrZn2 (ferromagnetic materials). Zinc is an essential element for humans and other animal nutrition. Zinc-deficient animals require 50% more food to gain the same weight as animals with sufficient zinc. Zinc metal is not considered toxic, but if fresh zinc oxide is inhaled it can cause a disorder referred to as zinc chills or oxide shakes. Sources: The primary ores of zinc are sphalerite or blende (zinc sulfide), smithsonite (zinc carbonate), calamine (zinc silicate), and franklinite (zinc, iron, and manganese oxides). An old method of producing zinc was by reducing calamine with charcoal. More recently, it has been obtained by roasting the ores to form zinc oxide and then reducing the oxide with carbon or coal, followed by distillation of the metal. Oxidation States: +1 and +2. +2 is the most common. 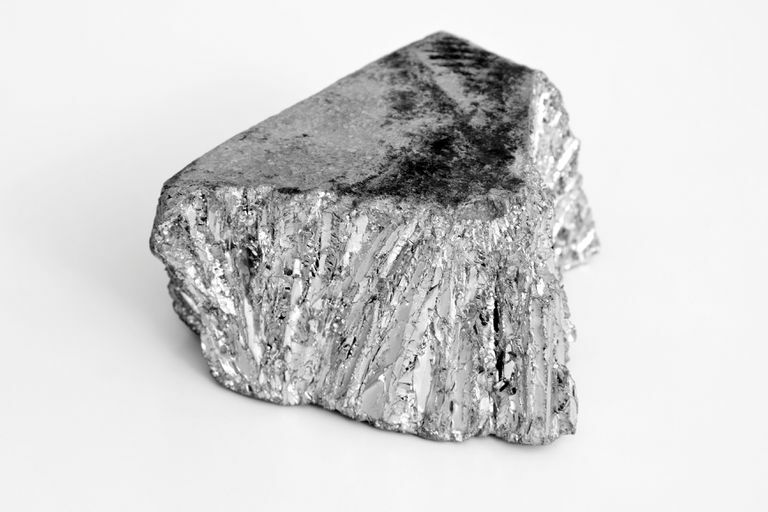 Zinc is the fourth most common metal used today (after iron, aluminum, and copper). Zinc exposed to air will form a layer of zinc carbonate by reacting with carbon dioxide. This layer protects the metal from further reactions with air or water. Zinc burns white-green in a flame test. Zinc is the last period four transition metal. Zinc oxide (ZnO) was once called "philosopher's wool" by alchemists because it looked like wool when collected on a condenser after burning zinc metal. Half of the zinc produced today is used to galvanize steel to prevent corrosion. The U.S. penny is 97.6% zinc. The other 2.4% is copper.